See also the youthful heads wearing a petasos (36A). The many examples from the east in 'other materials' parallel the popularity of the subject there on hellenizing finger rings. (e.g., GGFR pl. 1072). 33/X1 Paris, Bibl.Nat., de Clercq no. 2811, pl. 19, from Amrit. Chalcedony scaraboid. BL. 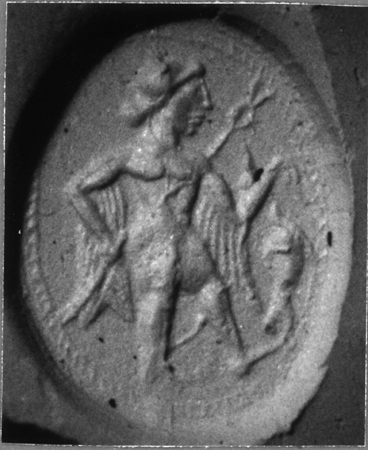 Naked, with petasos, caduceus, and purse?, held over a tortoise. 33/X2 Paris, Bibl.Nat., de Clercq no. 2812, pl. 19. Cornelian scaraboid. In a silver mount. 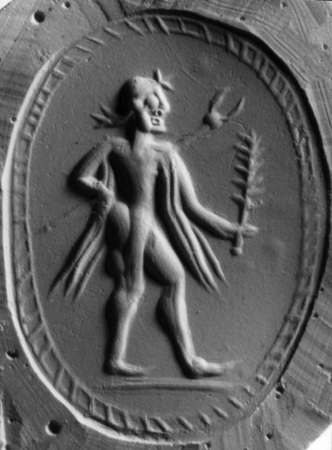 Naked, with chlamys over arms, caduceus, holding branch; ground line. 33/X3 Paris, Bibl.Nat., de Clercq no. 2813, pl. 19. Glass scaraboid. Naked with petasos, chlamys over arms; ground line. 33/X4 Paris, Bibl.Nat., de Clercq no. 2814, pl. 19, from Amrit. Cornelian. 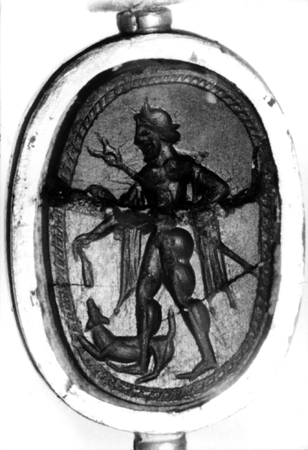 BH; in a gold mount on a silver hoop A. Bearded, with chlamys over arms and caduceus; a dog in front. 33/X5 Paris, Bibl.Nat., Seyrig 1973.1.489. GGFR pl. 1072. Chalcedony scaraboid in silver mount. 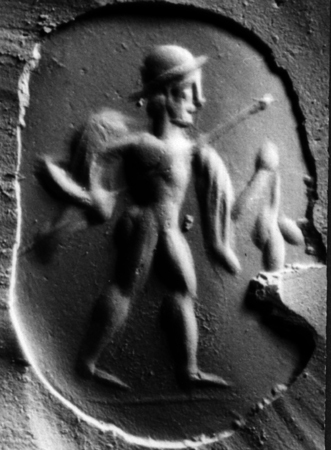 Naked, with petasos, chlamys over arms, caduceus, a ram before him. 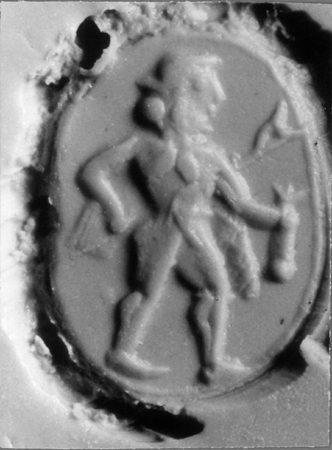 Inscribed 'Baal'. 33/X6 Private Coll. Blue chalcedony. BH. 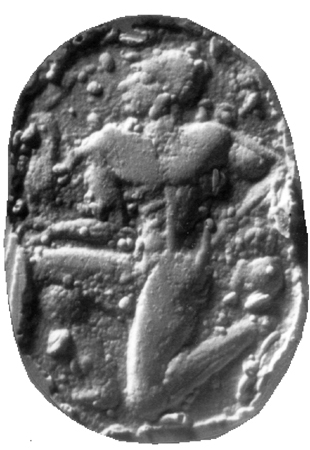 With caduceus and branch before a crater; inscribed in Phoenician orr. 33/X7 Private. Wiegandt no. 46. Cornelian. BH. 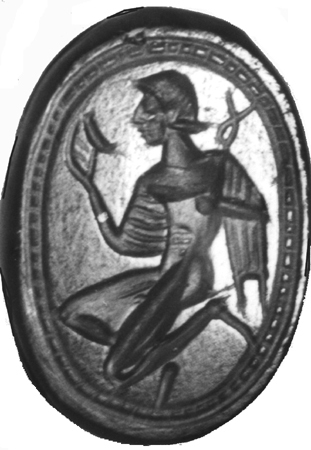 Kneeling youth in chlamys holding a caduceus and a cup. The type suits either komast or Hermes. This confusion and general style suggests the Classical Phoenician series.